Kupffer cells are macrophages endogenous to the liver which have the ability to modulate hepatic inflammation and injury associated with various pathophysiologies and toxicities. 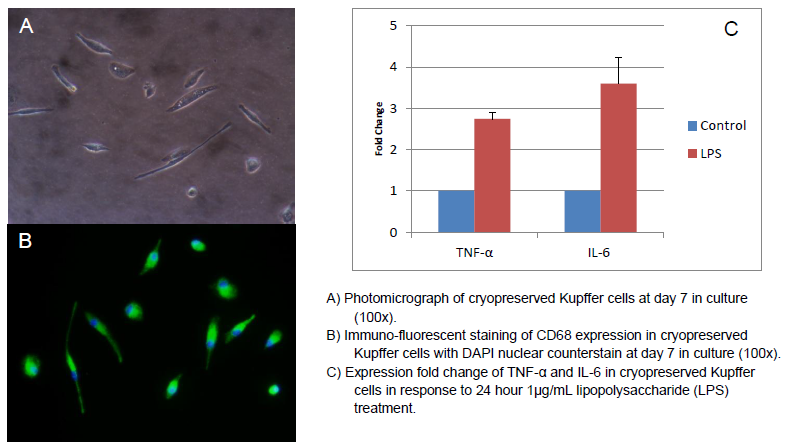 Pro-inflammatory cytokines released by activated Kupffer cells, such as TNF-α and IL-6, are associated with up-regulation of acute-phase response proteins and suppression of CYP enzymes. For new biological entities, particularly immunomodulators, evaluating the potential for Kupffer cell activation is an emerging concept in preclinical development. Kupffer cells are estimated to comprise approximately 4-8% of total liver cell content and approximately 20% of non-parenchymal cells (Raccanelli and Rehermann, 2006). You can also get non-parenchymal liver population from freshly isolated liver sections. Get in touch with mycells@tebu-bio.com for detailed information. For mouse or rat, there is also the Liver Dissociation System 3, which contains and engineered enzyme dissociation cocktail.